The Phillies evened their season-opening series with the Red Sox with a 4-2 win over Boston at Citizens Bank Ball Park on Wednesday night. 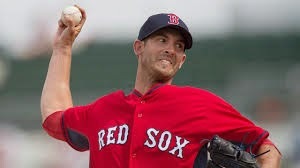 The game was scoreless until the bottom of the sixth inning when Jeff Francoeur homered off Red Sox starter Rick Porcello (pictured) with two on to give the Phillies a 3-0 lead. Philadelphia added a run with a sacrifice fly by Chase Utley in the bottom of the seventh. Boston scratched back for a pair of runs in the top of the eighth inning on an RBI single by Xander Bogaerts and a bases loaded walk to Pablo Sandoval. Porcello went six innings in the loss. He was charged with three runs on six hits. He walked two and struck out four. Former Red Sox closer Jonathan Papelbon earned the save for Philadelphia.